Which part of the muffin is the best? The muffin top! Imagine indulging in chocolate decadence! Hmmmm! I am in Muffin Top heaven! 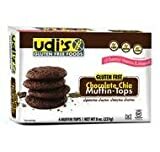 With Udi's Chocolate Chia Muffin-Tops you can now experience Muffin-Top Heaven whenever you'd like! Fortified with vitamins and flavor, the Chocolate Chia Muffin-Tops will healthily satisfy all of your sweet-tooth cravings.